ItemF-07879 - Victoria in five parts, taken from the cupola of the Driard Hotel; see F-07877, F-07878, F-07879, F-07881, F-07882; HP002108. ItemF-02797 - John Kendrick's signature. ItemG-07880 - Helen Fannie McNeill. ItemF-02317 - "Compliments of W.H. Harbeck, Official Motion Picture Photographer, C.P.R. "; American cinematographer Harbeck and his camera in front of Takakkaw Falls, Yoho Valley, on line of Canadian Pacific Railway. ItemA-04457 - Archival exhibits at the Legislative Buildings in Victoria. ItemA-08450 - John Wesley Sexsmith. ItemA-01355 - Mrs. William Wale, of Langford's Yew Tree Farm. Item F-02317 - "Compliments of W.H. Harbeck, Official Motion Picture Photographer, C.P.R. 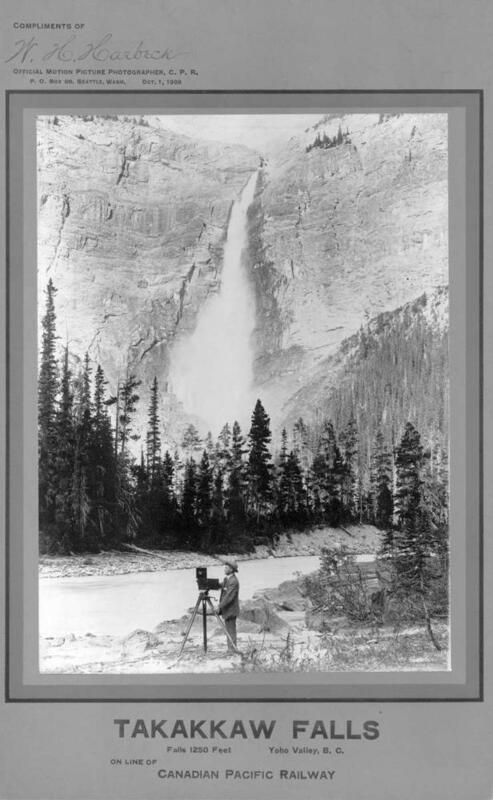 "; American cinematographer Harbeck and his camera in front of Takakkaw Falls, Yoho Valley, on line of Canadian Pacific Railway.